(CLOSED)A Lot of E.L.F. Giveaway! I’m taking a little break but I’ll be back with videos and posts tomorrow! I picked this up on clearance. I thought that this is a great way to try some e.l.f. products for the first time. For me and one of YOU!!! Winning this set is great in order to try some products for the first time or nice if you are already a fan of the brand! Please use the Rafflecopter tool below and enter to win! International readers are welcomed to enter as well! My favorite is their blush, soo pigmented. their lip scrub is really good and its only $3!!!! cant beat that deal!!! Cool! Thanks for the giveaway! My favorite elf product is the powder brush. I have about 6 of them. I’ve never tried before! But I heard that they’re really good, so I would love to try it! I love E.L.F. products…they are affordable and they work. I own a few brushes and I love them all. But my fav product is the Mist & Set Spray. I recently purchased it from Tarjay and I love it! I like their mineral foundation and their face primer. My favorite is the makeup remover wipes! My fav ELF is the brushes! I have only tried their brushes but I like them! I love their lip glosses and brushes. I love their Mineral lipgloss in Bare & Blush in Pink Passion. I LOVE the Complexion Brush from the Studio line. It is sooo soft and perfect for powder. I love e.l.f. products. I love the affordability of their brushes, and I really like the majority of their eye shadows. My favorite ELF products are their Studio Line Bronzer and Blush duos and thene 40 palette. I love their brushes! When I first started wearing makeup again, they were and still are my go to brushes. Thank you for the giveaway! Keep us posted on how you like! My makeup collection mainly consists of elf coz it’s cheap!. I love the 2 in 1 conditioning gloss. It’s super duper conditioning. Totally love it! My favorite products are the makeup setting spray, flat powder brush, small stipple brush and their baked blushes. Forgot to mention that I use the baked blushes as highlight for my cheeks, they aren’t very pigmented. My favorites are the professional blending eye brush, professional crease brush, studio complexion brush, studio angled blush brush, all the studio blushes, the studio blush & bronzer duos, tone correcting concealer, and the studio lip exfoliator! Love their contouring blush and bronzer their custom compact so I can create my own little on the go palette their lip exfoliator an their glossy gloss! Oh goody! Me wanna win. I have never tried elf makeup but I did buy it for my daughter. i love their stipple brushes and eye palettes because of the variety! I really like their lip exfoliator! 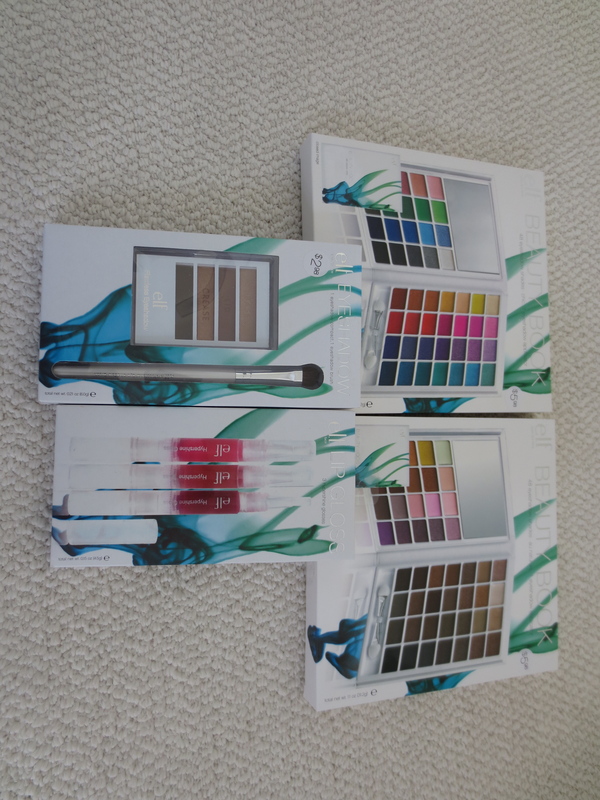 I am a gloss lover, ELF cosmetics are FANTASTIC! Great Giveaway! Wow what a great giveaway! I am a gloss addict, lol! Elf cosmetics are so awesome! E.L.F were amongst the first brands I bought when I decided to get more into makeup, and they continue to be a fave. I love their eyeshadows, brushes, and baked bronzer. Amazing how pigmented they are for the price. I love the kabuki brush! I’m joining this giveaway because I don’t have any elf cosmetics.. I like their eyeshadow palettes the most. Yes, I have a lot of E.L.F. Products, but my favorite product by the brand has to the Blush/Bronzer Duo. I love their blushes and lipglosses- can’t beat the price! Their brushes are the business! I have the eye shadow & blending brushes. I didn’t try E.L.F. products yet. I love their brushes. I love the studio face brushes and the dollar line for eye brushes. The 144 neutral palette is great for everyday. I’ve never tried ELF makeup before, so I am excited about this giveaway! Love a lot of their brushes and studio blushes. I love the eyeshadow, think shader, brush!!! I’ve tried the clear mascara as eyebrow gel. Only $1! I have tried a few elf products earlier. I love the blushes from them the most..They also have fantastic nail polishes. You must try some. I would not recommend the gel eye liners though because they dry out too quickly. Their glosses and makeup brushes are also pretty decent for the price. I have never tried elf products. Have not been able to find them. I love their studio line brushes and their HD powder. I have not tried their products yet but I would like to! I have only tried one thing from ELF and that was a pair of their false eyelashes, and it was my first time wearing false eyelashes so I didn’t know how to apply them. It was not a memorable day, and since than I’ve never tried false lashes again! My favorite product is their hypershine lip gloss. Totally amazing for $1! Elf blush and eyeshadow quads are some of my favorites from them! Also the $1 eyelid primer! No, I haven;t tried E.L.F. products yet as they are not available in my country. 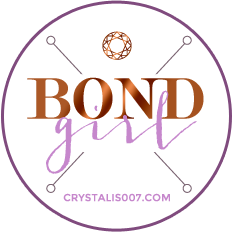 I’m excited about this giveaway as it will introduce me to a new brand/product! my fav elf product are the makeup brushes! I never try e.l.f. !I am from Greece and we don’t have this brand here! My favorite elf product is the studio blush and bronzer duo! I love the glossy glosses. Thanks for the giveaway! My favourite product is the E.l.f Complexion Perfection!!! I’ve tried a bunch of ELF products before and my definite favorite are the Mineral Lipsticks!They are so hydrating and I love all the shades,especially “Runway Pink”! I haven’t tried it yet! i’ve never tried elf products but i love to…! unfortunately, i haven’t tried it so far, but it’d be a great chance if i won : )FINGERS CROSSED!!! I have never tried a elf product! I have many ELF products but my fav is the lipstick`s palette!!! Just great!! Unfortanetly I didn’t have chance to try ELF cosmetic. No, I never tried before. I just recently got ELF’s cream eyeliner and it’s so pigmented and smooth! I love it! I never used this brand! Honestly I think that the best thing that elf has is their black liquid liner. No one can tell it’s inexpensive, goes on and dries like a dream. It won’t come off until you wipe it off — perfection! I have tried elf brushes and they are great! I love the studio line blushes!! I tried elf eye shadow and it was good, very pigmentaded and long lasting. Yes now, my favorite is the eye primer .. I have their High-Definition Powder and love it. I also have two of the baked mineral eye shadows and the shades are beautiful! Thank you so much for this giveaway, Crystal; I’d love to try more of ELF’s products! Not yet But I’m excited to try one soon! I love the $1 primer. I use this for everyday wear. I also love their studio line brushes. A big bang for your buck! Woow another giveaway, so generous of you!! Thanks so much. Actually I’ve never tried anything from Elf, I wish I had the chance sometime ’cause I know they do have very good products. Hi, I’ve not tried Elf before so would be great to win and try them! I haven’t tried ELF before but I’d love to! Thank you! I tried ELF, I love all studio products! I’ve never had the opportunity to use any product of the brand. It’s rare where I live and when find it, it’s too expensive. No I haven’t had the chance yet. Yes! I loved the facial whips in golden peach and lilac petal! Yes!!! I have the bronzer and blush duo and i absolutly love it!! I love ELF nail polishes and eye shadow! My favorite nail polish is bubble gum pink. My favorite eye shadow is their 100 piece eyeshadow palette. I love very much the lipgloss. My favorite product is the studio powder brush. Thank you so much for putting your time, effort, and energy into these! I have the ELF mineral primer and it seems pretty good — not the best, but good for the price. And their one dollar lippies aren’t bad! I got the “Studio Endless Eyes Pro Mini Eyeshadow Palette” in Natural as a gift & love it. Yes, I have tried E.L.F. Products and my brush holders are from E.L.F., Most of My Makeup Brushes are from the Studio Line, but if I had to choose something it’d be kind of difficult, but it would be their Baked Blushes. I actually haven’t tried any e.l.f. products yet! I keep meaning to pick up a few to try when I’m at the store, but I always forget! I love E.L.F! Especially their brushes and soft eyeliners! I never tried E.L.F. products before! I have not tried any E.L.F products! I love the Elf blush! 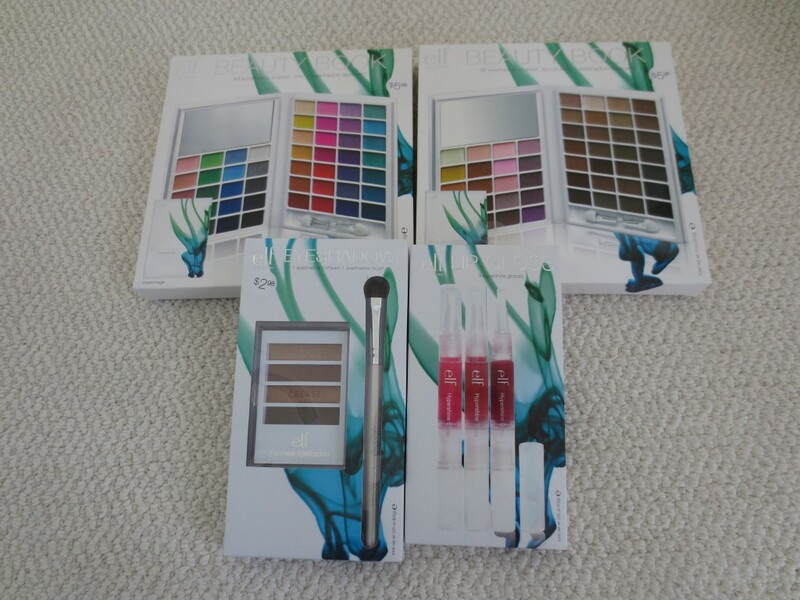 Love ELF products – especially the eye shadows. These are the almost the only ones that don’t cause me irritation. My favorite elf product is the blush and bronzer duo. I’ve never tried before but I would love to. have not used any ELF products before, never found any here in Australia. I use the brushes. I have some shadow but I haven’t used it yet. I absolutely love ELF products! I especially love their kabuki face brush and their shimmer palette. They’re both fantastic products! Thank you, Crystal for the giveaway! I’ve tried their lip shines! Very nice! I love their hypershine gloss!